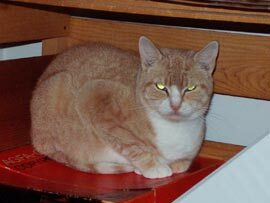 Goldie is our most recent arrival & one of our most feral cats. She's very timid & prefers to stay in her hiding carrier. Except at mealtime, that is. Her private room was opened up to the other cats when the bunk beds were assembled, so hopefully she's getting used to having company. She's a cute little cat & we'd love to see that glower of angst replaced with a content relaxed smile. Hopefully with time; we'll be patient.